Wiss 5-Blade Hand Crimper is for crimping round metal pipe to create a male fitting end. This Wiss hand crimper crimps heavier gauge pipe up to 22 gauge galvanized steel, and has an optimal handle span for maximum power and comfortable operating range. The non-slip cushion grips provide superior comfort and control. Wiss 3-blade hand crimper crimps male fitting end to connect guttering, downspouts or metal pipes. 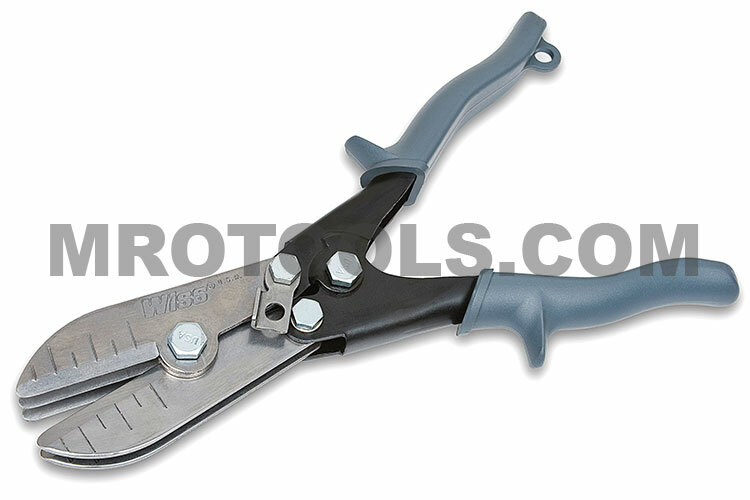 This Wiss hand crimper features an optimal handle span for maximum power and comfortable operating range. Wiss 5-blade hand crimper is for crimping round metal pipe to create a male fitting end. This Wiss hand crimper crimps heavier gauge pipe up to 22 gauge galvanized steel, and has an optimal handle span for maximum power and comfortable operating range. Wiss 12'' folding tool is commonly used for 3/8'' and 1'' depth folding channels to ensure proper depth alignment, and making long uniform bends in sheet metal. Wiss 18'' folding tool is commonly used for 3/8'' and 1'' depth folding channels to ensure proper depth alignment, and making long uniform bends in sheet metal. Wiss 24'' folding tool is commonly used for 3/8'' and 1'' depth folding channels to ensure proper depth alignment, and making long uniform bends in sheet metal. Wiss hand notcher, HVAC cuts 30 degree V shaped cut in sheet metal gives clean notches without slipping at corners and take-off tabs. Wiss hand notcher features non-slip cushion grips for superior comfort and control. Wiss 3'' hand seamer with a straight handle is used to bend and flatten sheet metal. The Wiss hand seamer has an optimal handle span for maximum power and comfortable operating range, and non-slip cushion grips for superior comfort and control. Wiss 3'' hand seamer with an offset handle is used to bend and flatten sheet metal. The Wiss hand seamer has an optimal handle span for maximum power and comfortable operating range, and non-slip cushion grips for superior comfort and control. Wiss 6'' hand seamer with a straight handle is used to bend and flatten sheet metal. The Wiss hand seamer has an optimal handle span for maximum power and comfortable operating range, and non-slip cushion grips for superior comfort and control. Wiss cable tie tensioning tool is designed to install both heavy and light duty nylon cable ties, for tightening nylon ties when securing flex duct to take-off collars. The WC5LN Wiss 5-Blade Hand Crimper, 1 5/8'' Throat Depth is one of thousands of quality tooling products available from MRO Tools. Please browse Wiss Heating, Ventilation and Air Conditioning Tools for tools similar to the WC5LN Wiss 5-Blade Hand Crimper, 1 5/8'' Throat Depth. WC5LN Wiss 5-Blade Hand Crimper, 1 5/8'' Throat Depth description summary: Wiss 5-blade hand crimper is for crimping round metal pipe to create a male fitting end. This Wiss hand crimper crimps heavier gauge pipe up to 22 gauge galvanized steel, and has an optimal handle span for maximum power and comfortable operating range. Quantity discounts may be available for the WC5LN Wiss 5-Blade Hand Crimper, 1 5/8'' Throat Depth. Please contact MRO Tools for details.